The Skeptic’s Society published a brief .pdf file in 2010 (available for download on skeptic.com or here: top-10-evolution-myths) titled “Top 10 Myths About Evolution (and how we know it really happened)”. The article basically lists ten examples opposing the theory of evolution and attempts to refute them. NotAccidental.com’s “Refuting the Skeptic” articles look into their claims in much more detail, and exposes their falacies. The “Top 10 Myths” article only superficially states their case in favor of evolution in one or two paragraphs, which is fortunate for them, because delving more deeply into each issue exposes the falsehood of evolution more substantially. 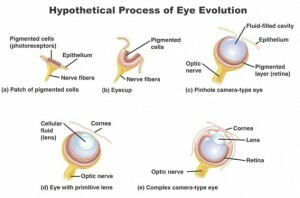 The eye is frequently used in the discussion of evolution and creationism. I think this is because much is known about how the eye functions, it is very accessible for research in design and function, and because people place much value on their vision. However, as an ophthalmologist (eye physician and surgeon), I have more than just a passing knowledge and appreciation for the eye. The arguments that the writer makes in the article above reveal only a cursory knowledge of the function of the eye and in reality point toward design by a Creator rather than random development through evolution. First, the author argues that the eye is build upside down and backwards, and that this is an example of imperfect design (i.e. not by a Creator). It is true that the superior retina serves the lower field of vision, the lower retina the upper field of vision, etc. However, this issue is resolved as the optic radiations reach the visual cortex of the brain, and the brain automatically orients the visual stimuli appropriately through perception. Cameras and many telescopes also take an inverted and backward photograph because it is optically more straightforward for the eye and the camera to capture an image in this fashion. Similar to digital processing in a digital camera, the brain properly orients the visual stimuli. My challenge to evolutionists would be to describe how an eye could have even evolved without accounting for this need for the re-orientation. Otherwise, vision would have been a significant selective disadvantage for an organism trying to escape a predator, for example, where instead running from the predator it might run right into it! Second, the author also takes a stab at a well known alleged imperfection of the eye that light has to travel through a large number of structures in the eye including many retinal layers before reaching photoreceptors that actually receive the visual input. This is allegedly imperfect, inefficient, and would lead to degradation of the image. First, the human eye is capable of perceiving a single photon of light (the smallest possible unit of light), which would be the dimmest star visible in a clear night sky. So, there is no significant loss of light through these layers. What is more amazing from an evolutionary standpoint is how the structures of the eye could have simultaneously evolved with the requirement that all of the following structures would have to be not only functional but also transparent, and all at the same time: the corneal epithelium, the corneal stroma, the cornea endothelium, the aqueous fluid, the lens capsule, the substance of the lens, the vitreous fluid, the internal limiting membrane of the retina, and a large number of additional retinal cell layers, retinal neurons, retinal blood vessels, and retinal supporting cells before reaching the light sensitive photoreceptors! Any opacity of any of these structures would have halted visual function completely. The primary reason, from a functional level, that the retina has photoreceptors as an outer layer of the retina is so that their high metabolic need can be met by nutrients and oxygen diffusing through the opaque retinal pigment epithelium from the very vascular choroid behind the retina. The retinal blood vessels serve the less demanding inner layers of the retina. Two separate blood supplies to accomplish one function – another mystery for the evolutionists. The vertebrate eye actually illustrates several of the Concepts of Non-evolution (click to review these concepts). 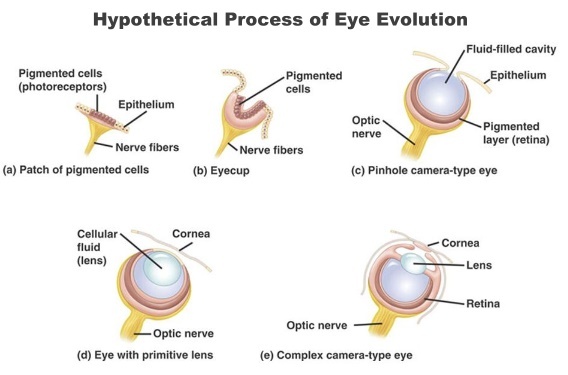 If we go back to the example above of the multiple transparent structures, layers, and membranes of the eye, consider how those structures fit into the hypothesized evolution of the eye. Each of those structures has a different function, and yet must be transparent. In the diagram showing hypothetical eye evolution, the drawing labeled “c” has a small opening into a fluid filled eye cavity, while in “d” the cavity is closed over. If natural selection was driving this process, the “epithelium” lining the entry point of the pinhole camera-type eye “c” would need to be as opaque as possible to maximize the effectiveness of the pinhole. However, in “d”, the membrane covering the opening must suddenly switch to being transparent rather than opaque, or all light would be blocked from entering the eye. The process of natural selection would block any evolutionary change causing the ocular opening to be covered by anything but a transparent membrane. This process would be similar for the formation of the lens in the eye. This is one of the Concepts of Non-Evolution, that natural selection impedes the formation of new traits rather than facilitates them. The corneal stroma is carefully structured to minimize light scatter with important contributions from the extracellular matrix with its proteoglycans, carefully spaced collagen fibrils and crystallin-expressing keratocytes. Dysfunction in any of these components can cause a loss of transparency and crucial loss of function. The amount of light scatter across the front to the back of the corneal stroma has been estimated at less than 1%. The cornea is even more complex than this, with an active pumping mechanism within the corneal endothelium that keeps fluid from building up within the cornea, a protective outer epithelial layer which is also transparent, and all of this with no blood supply, only nutrient diffusion from the air, inside the eye, and from the perimeter of the cornea. If any of these functions fail, the cornea would become opaque and visual function would be lost. The eye shows incredible evidence of design and function which could not have arisen spontaneously through mechanisms of random mutations and natural selection. The Skeptic’s claims that the eye is imperfect and thus could not have been designed and created by God are refuted.